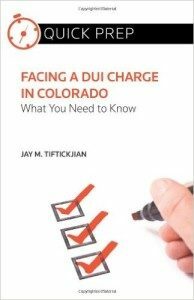 Facing A DUI Charge In Colorado - Tiftickjian Law Firm, P.C. Being accused of a DUI can be frightening, and for good reason. Colorado is not lenient on those who it believes were driving under the influence, and prosecutors will attempt to get a conviction and appropriate punishment – possibly including fines, loss of driving privileges and even jail time. When you find yourself in a situation where so much is at stake, it is is extremely important that you take every possible step to protect yourself, including educating yourself on the DUI process and hiring an attorney that you can trust to fight passionately on your behalf. Published by Thomson Reuters-Westlaw in 2013, Facing a DUI Charge in Colorado is essential reading for anyone accused of a DUI, DWAI or DUI-D. The DUI process can be intimidating, especially if you do not have any legal training or have not gone through anything like it before. By reading this book you can get a clear understanding of the steps you will be going through, and how you can best navigate those steps to protect your rights and get the best possible outcome from your case. Facing a DUI Charge is available at Amazon and the Westlaw Store.